The boards and pages are from an old atlas. The sayings are from a posting on the Cyberscribes' listserv. 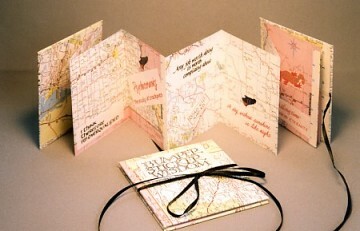 The sayings were printed with a Gocco printer and printed on Crack 'n Peel paper, then embossed. I also included tennis shoes, road kill and a lizard as just a few of the things we see along the highway. Book 4″ x 3½″ (10.25cm x 9cm).